The new Stromberg 28 inch SuperSign ! Looking for a cool, max impact wall sign ? You got it …Our new Stromberg Carburetor Authorized Sales & Service SuperSign weighs in at a giant 28 inches diameter and no less than 8lb shipping weight. There’s no way you’re going to miss this baby in your workshop, garage or porch. All our signs are proudly made in the USA, of course, using heavy gauge American steel. That cool patinated vintage style artwork is printed in period colors with a smart dye-sublimation process, so the image is baked into the powder coating for a durable and long lasting finish. And with two riveted fixing holes (top and bottom), it’s easy to fix, too. To give you an idea of the scale, our picture shows both 28inch and 14inch versions. Both are available to order at our Clothing & Collectibles store on the Stromberg website – www.stromberg-97.com . 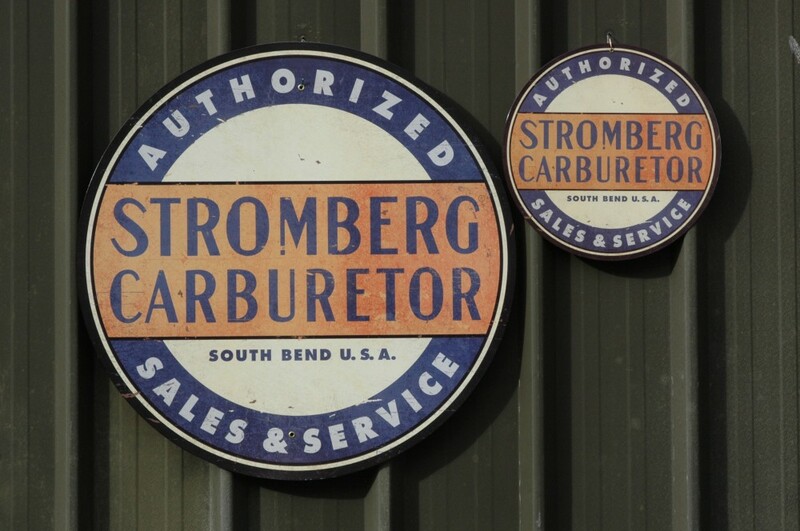 This entry was posted in Stromberg product news and tagged hot rod, Stromberg, tin sign by Clive. Bookmark the permalink.